Click Below to Register for FORMED! Online giving makes donating to our Our Lady of the Mountains quick, convenient, and most importantly, secure. Donating online is the easiest way to ensure your donations are received regardless of where you may be. Click below to make a one-time or set-up a recurring online donation to our parish! Please purchase your card in our Gift Shop. The Knights of Columbus will be selling Safeway Giving Cards after Mass. This is a debit card that you use at Safeway or Albertsons that credits 3 to 4% to OLM every time you use it! Cost is $5, and is credited to the card balance when activated. 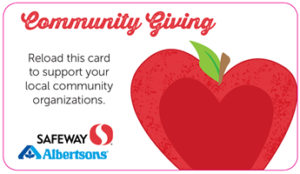 OLM will get between 3 to 5% on purchases made by these cards at any Safeway/Albertsons stores or Safeway Gas Stations! This is free money for the parish that anyone who shops at Safeway contributes.